Sina, age 16, is an orphan and head of her family, and takes care of two younger sisters. She earns a monthly wage working for the Sharing Foundation's Sewing Project, a vocational program run by the Foundation that trains young women so they can earn a sustainable living wage with a home-based sewing business or a better paying job in Cambodia’s garment industry. The Sew Project is a four-month course, enrolling two new female students every two months, teaches young women a skill that enables them to support their families substantially better than they can by farming. The selected students are paid from their first day in sewing school. They start by making white school uniform shirts, which with blue pants or skirts, are put together in “school uniform packets” and delivered to poor schools that need them, or to SCAD (Street Children's Assistance and Development), which works to get street children into school. The Sewing School is a win/win program, as the students learn a trade that can get them a well-paying supervisory job in the garment industry, and TSF can donate 1,400+ uniforms yearly to kids who might otherwise not be able to go to school. 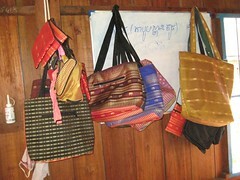 Sewing students, as they develop more skills, make the tote bags, back packs, and purses which are brought to the USA and sold by volunteers at church fairs and the like, thus making the sewing school self-sustaining. A few graduates choose to stay on in the sewing school shop, earning substantial wage. That's an example of the bags. One of our dedicated volunteers in the US, Mary Hult, is in charge of the crafts and organizing our volunteers who sell items all year long. Many of us who are connected to the Sharing Foundation purchase items as gifts. Last night, at the Spices of Life holiday party, I gave bags to Nina, Carol (Steve Garfield's wife) and Haily. This is just one example of the great work that the Sharing Foundation does to support children in Cambodia.